NEW YORK (AP) — President Donald Trump says he directed White House Press Secretary Sarah Huckabee Sanders not to bother with the traditional daily briefing of reporters. In a tweet on Tuesday, the president said the press covers Sanders "so rudely & inaccurately, in particular certain members of the press. "I told her not to bother, the word gets out anyway!" he tweeted. "Most will never cover us fairly & hence, the term, Fake News!" WASHINGTON (AP) — The Pentagon says President Donald Trump's former chief of staff is on track to join the Navy Reserve, buoyed by a recommendation from Defense Secretary Jim Mattis. WASHINGTON (AP) — White House press secretary Sarah Huckabee Sanders is defending the scarcity of the daily press briefing. Sanders last answered questions from reporters in the White House briefing room on Sept. 10 — an appearance that followed a nearly three-week absence by Sanders. She tells "Fox News Sunday" that she's no longer doing a daily briefing because President Donald Trump is doing more short question-and-answer sessions with journalists. NEW YORK (AP) — A lawyer for Sean Spicer says an accusation that the former White House press secretary used a racial slur to describe a black student while in high school is false. Attorney Michael Bowe says in emails to The Associated Press on Saturday night and Sunday that the allegation is false and defamatory. SEEKONK, Mass. (AP) — Former White House press secretary Sean Spicer's publisher says a book signing at a Massachusetts warehouse store has been canceled "due to the political climate." Regnery Publishing said in a statement that the BJ's Wholesale Club in Seekonk canceled Spicer's book signing that was scheduled for Saturday to mark the release of "The Briefing," which came out Tuesday. WASHINGTON (AP) — Former White House press secretary Sean Spicer's new book reflecting on his time at the podium paints a rosy if sometimes thorny picture of his former boss, describing President Donald Trump as "a unicorn, riding a unicorn over a rainbow" and a man to whom the regular rules of politics don't apply. NEW YORK (AP) — Fox News says host Kimberly Guilfoyle is leaving the network, amid reports that she's about to take on a new role with a super PAC supporting President Donald Trump's agenda. NEW YORK (AP) — Sean Spicer's book tour will be a mix of public and private. Almost from the start, the emergence of Sean Spicer, Connecticut College Class of '93, as press secretary for President Donald Trump, produced one cringe-worthy moment after another for fellow alumni like me, starting with the lies about the size of the Trump inaugural crowds. The Shale Insight Conference, which has attracted the likes of Donald Trump and Sean Spicer, will return to Pittsburgh on Oct. 23-25. The organizers -- the Marcellus Shale Coalition, Ohio Oil and Gas Association and West Virginia Oil and Natural Gas Association -- have not yet announced a keynote speaker but said that registration is now open. The event will be held at the David L. Lawrence Convention Center. BOSTON (AP) — Former White House press secretary Sean Spicer is wading into the Massachusetts U.S. Senate race. Spicer will be the featured speaker at a fundraiser for Republican state Rep. Geoff Diehl on April 12 at the Union Oyster House in Boston. Former White House spokesman Sean Spicer said Friday he is OK with the reports of "chaos" inside the Trump administration, considering the president's record of accomplishment and the way he has followed through on his campaign promises. "If chaos gets you 313,000 jobs last month, it gets North Korea to the table, it gets ISIS on the run, border crossing down, the regulatory state dismantled, conservative judges, than I think we are doing pretty damn good," Mr. Spicer said on "Fox Friends." Former White House press secretary Sean Spicer said Monday that any information regarding possible improper conduct regarding FISA warrants should be reviewed prior to releasing them to the public. "I would actually agree that I think until people at the Justice Department have an opportunity to look at it, we would not want to do anything that would compromise sources and methods," Mr. Spicer said on MSNBC. BERLIN (AP) — German linguists have declared the phrase "alternative facts," popularized by White House aide Kellyanne Conway, the non-word of 2017. Conway used the phrase last year when asked why President Donald Trump's then-Press Secretary Sean Spicer mischaracterized the size of the inauguration crowd. A team of six language experts at Darmstadt University chose "alternative facts" from among 684 suggestions. Former White House press secretary Sean Spicer said Thursday he is troubled that former White House chief strategist Steve Bannon has not denied the statements attributed to him in a recent book about the early days of President Donald Trump's tenure. "While he may continue to say he's a supporter of the President and his agenda, what we didn't hear is a denial," Spicer said in a conversation on HLN's "SE Cupp Unfiltered." July 19 — Trump gives an interview to the New York Times saying he regrets hiring Attorney General Jeff Sessions; he attends the first meeting of his electoral fraud council, repeating baseless claims of widespread vote fraud. July 19 — Trump gives an interview to the New York Times saying he regrets hiring Attorney General Jeff Sessions; he attends the first meeting of his electoral fraud council, repeating baseless claims of widespread misconduct. NEW YORK (AP) — A U.S. government lawyer argued on Tuesday that even just confirming or denying that the CIA has records about a January raid in Yemen would reveal intelligence secrets. The raid resulted in the death of a U.S. Navy sailor and Yemeni civilians. The American Civil Liberties Union filed a lawsuit in May seeking documents about the operation from the CIA and the departments of Defense, Justice and State. NEW YORK (AP) — Sean Spicer, the former White House press secretary, has a book deal. But don't expect him to criticize his former boss, President Donald Trump. Spicer's target will be some of the media outlets he once sparred with. Regnery Publishing, a leading conservative press, announced Tuesday that Spicer's book will come out next summer. Its working title is "The Briefing." NEW HAVEN, Conn. (AP) — The use of the term "alternative facts" by Kellyanne Conway, an adviser to President Donald Trump, tops a Yale Law School librarian's list of the most notable quotes of 2017. The statement Conway made when asked why Trump's then-Press Secretary Sean Spicer mischaracterized the size of inauguration crowds is one of many Trump-related quotations on the list, assembled by Fred Shapiro, an associate director at the library. A long-standing court order prohibiting the Republican National Committee from engaging in voter verification and other "ballot security" measures expired Friday, although a federal judge left open the possibility it could be extended if a prior violation is found. It's been a year this week since Donald Trump was elected president, surprising many in the mainstream. And while President Trump promised to be more presidential than any other president, has he succeeded? Are White House press briefings pointless? DES MOINES, Iowa (AP) — Marking a year since President Donald Trump's election, his fiercest advocates offered different approaches Wednesday for the Republican Party's way forward after some tough losses Tuesday. Each of the 11 events held at Harvard during Mr. Spicer's three-day fellowship were either closed-door forums, invitation-only get-togethers or private gatherings closed to the general student body and public, The Harvard Crimson reported Friday. WASHINGTON — Special prosecutor Robert Mueller is scheduling an interview with White House communications director Hope Hicks as part of his ongoing investigation of links between the Trump campaign and Russia, according to multiple news reports. Hicks, 29, of Greenwich, is one of several Trump operatives to be called in for interviews in recent weeks. Among the others: Former White House chief of staff Reince Priebus and former White House press secretary Sean Spicer. LOS ANGELES (AP) — Hard-working Emmy Awards host Stephen Colbert and a Sean Spicer cameo helped the ceremony avoid a ratings slide but failed to significantly boost viewership. Sunday's Emmys on CBS drew 11.38 million viewers to rank as the week's No. 6 program, according to Nielsen figures released Tuesday. That's slightly more than last year's audience of 11.3 million, which was a record low for the ceremony. NEW YORK (AP) — Sean Spicer says his surprise Emmy Awards appearance was a chance to have some fun, and suggested Tuesday that people who were upset by it were taking things too seriously. Clearly, not everyone was laughing, however. For Emmys host Stephen Colbert, there's also a risk that a joke he engineered could wind up doing collateral damage. NEW YORK (AP) — President Donald Trump never won an Emmy, it's true. But his presence was felt at this year's television awards ceremony more than any actor, writer or producer. Speaking Monday on "Fox & Friends," White House Counselor Kellyanne Conway says "America is responding by tuning out." Conway added people have a right to speak freely, but said "you're showing the world you're so easy with the insults about our leader." NEW YORK (AP) — Weeks after leaving his job, former White House press secretary Sean Spicer was onstage at the Emmy Awards on Sunday joking about one of his first — and more dubious — claims from the press room. 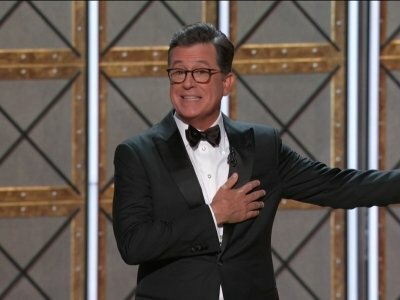 Host Stephen Colbert, playing the straight man in his opening monologue, said it was difficult to tell how many people would be watching the show. At that point, Spicer wheeled a podium onto the Los Angeles stage. NEW YORK (AP) — It was a different Sean Spicer who paid a visit to ABC's "Jimmy Kimmel Live" Wednesday night. WASHINGTON (AP) — A longtime conservative commentator is joining the White House as President Donald Trump continues to fill out his communications team. Mercedes Schlapp will serve as senior adviser for strategic communications, the White House formally announced Tuesday. Other changes are also in the works to fill vacancies following the departures of former Press Secretary Sean Spicer and Communications Director Anthony Scaramucci. WASHINGTON (AP) — Sean Spicer finally got to meet the pope.